Not too big a stack right? Very focused! On top is my everyday carry. 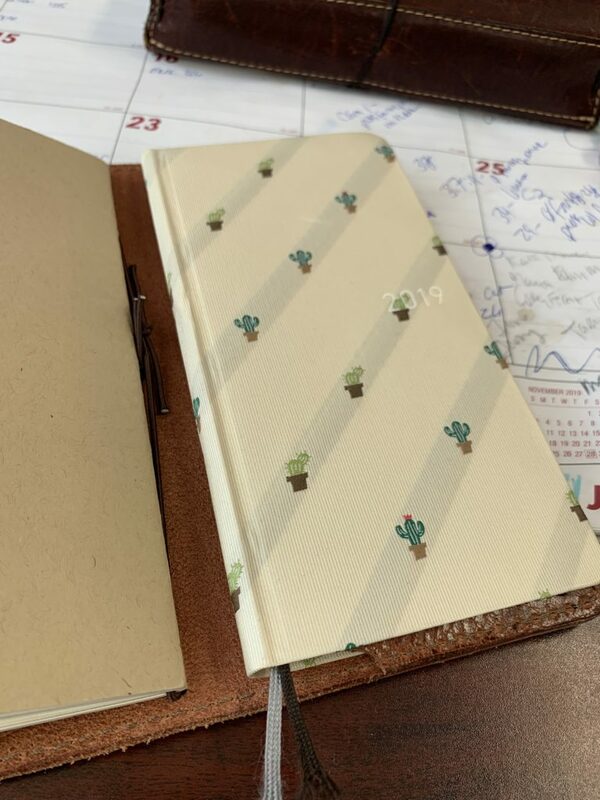 It’s not even a journal really, it’s a date book, I guess a planner. 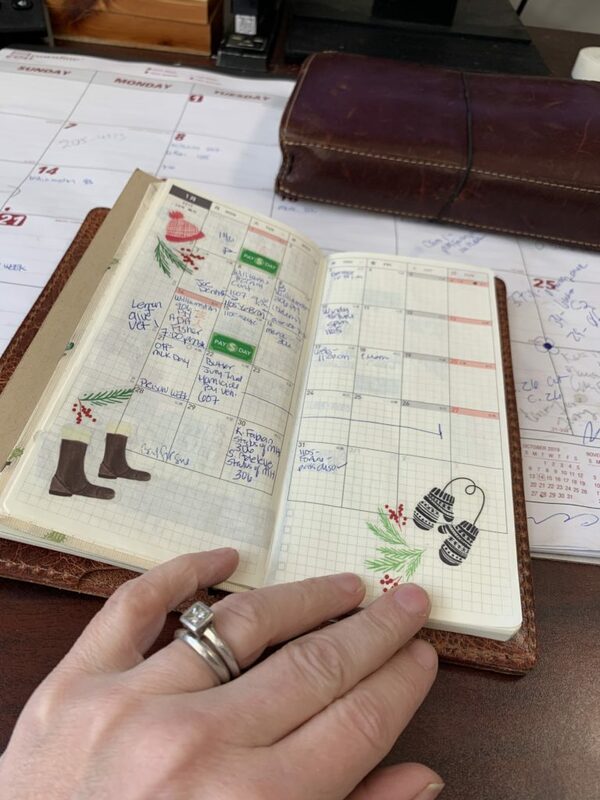 I shouldn’t treat planner like a dirty word, but I’ve been down that road of decorating rather than planning, and I’ve really decided that decorating is for memory keeping, and my carry around thing has to look at least semi-professional. Oh, so what is it? It’s a Hobonichi Weeks, housed in a Chic Sparrow Weeks cover in Golden Maverick leather. Can I tell you how much I love this cover? I really really really love this cover. I like to take it out to write things in it just because I want to touch it. And the size, which is about the size of a Hallmark pocket calendar, is perfect for carrying around with me in my bag, and taking out to schedule things when I’m in court. You may recall in my post, Foxy Fixed, that I had done a lot of research and Facebook group voyeuring to figure out what I wanted to buy, a Foxy Fix or a Chic Sparrow. In the end, I wanted some customization, so I went with Foxy Fix. The Foxy Fix honestly hasn’t held up so well. 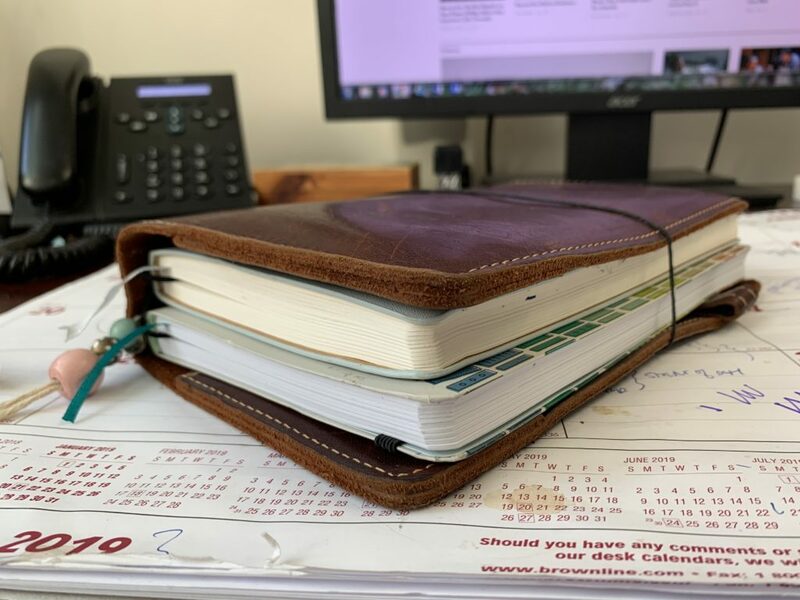 I could just be rationalizing buying something else, but the notebook has turned really floppy, and even with inserts that fill out the wide spine, it doesn’t really keep it’s shape. This causes the inserts to shift and move around a lot. I’ve tightened the elastic, and that doesn’t really solve the problem, it just makes it harder to open. I noticed that Foxy Fix discontinued the Rowena leather, so maybe this is a common problem that developed over time, or maybe they just ran out of that particular leather and didn’t want to restock it it. 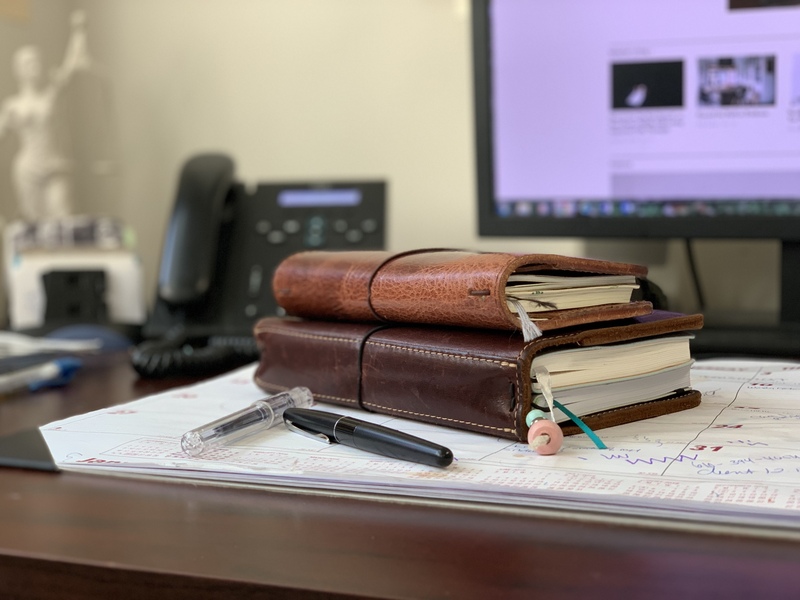 In any case, I was over the leather, and more importantly, the size – it’s way too heavy to lug around, and the wide spine for additional inserts was a mistake. 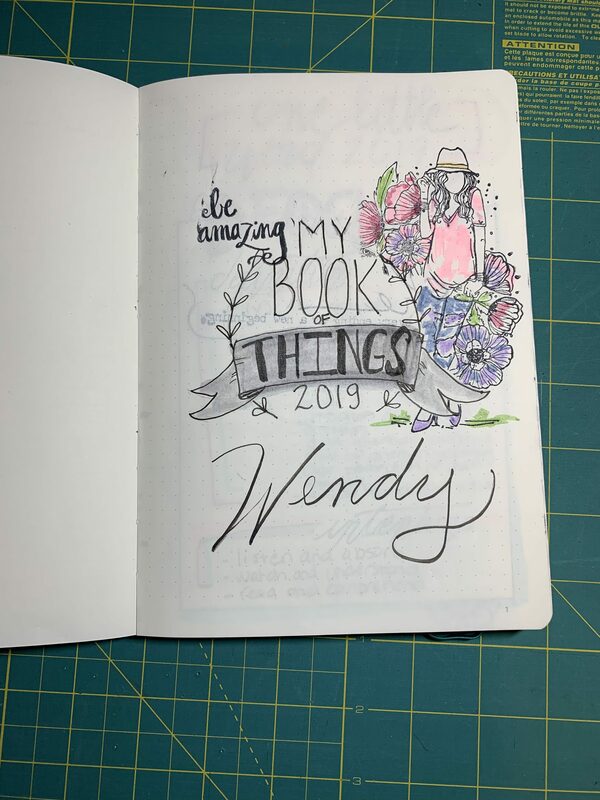 While chunky notebooks on Instagram are so pleasing to look at, in reality, they’re pretty hard to write in, and I think the wide spine is what is causing the inserts to sit in there wonky. 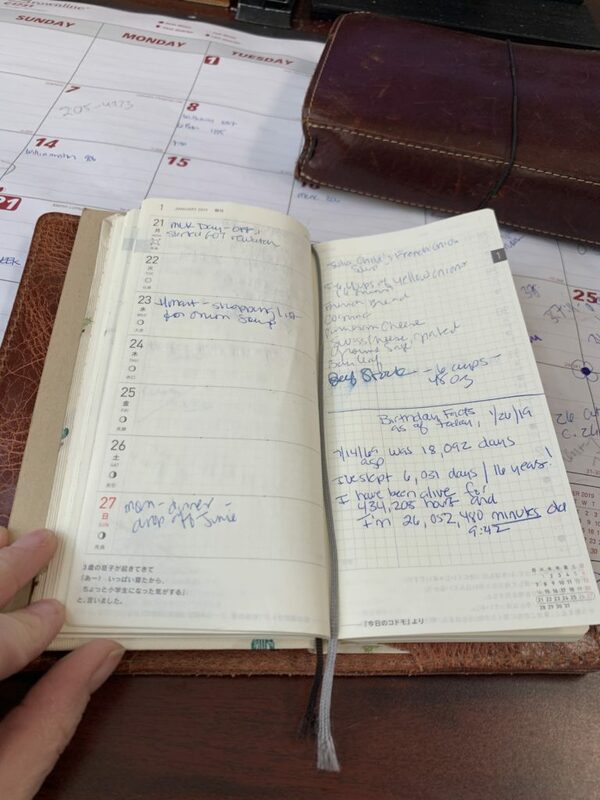 This time around, rather than picking the traveler’s notebook first and then picking the planner, once I saw the Hobonichi Weeks, I knew it was perfect for my needs. 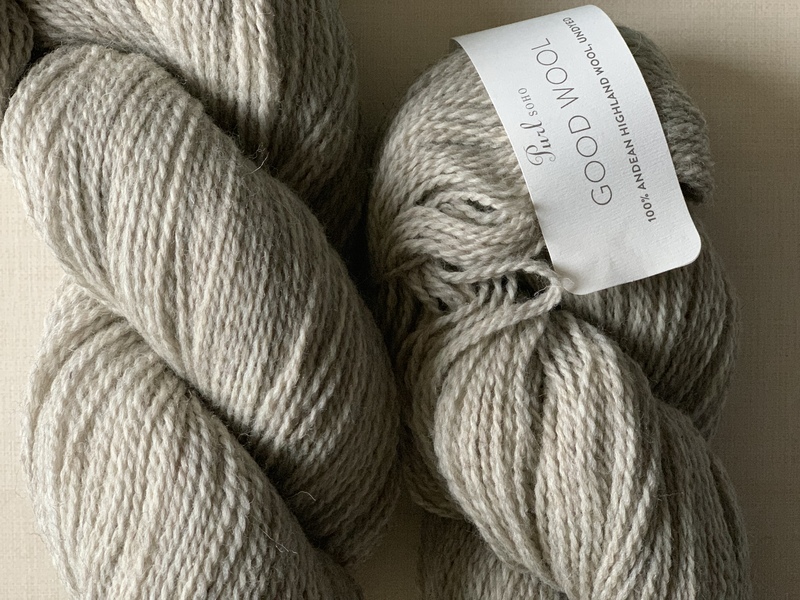 Lightweight and professional, with a little whimsy. Then, on youtube, I found the Chic Sparrow Weeks cover right away, and fell in deep like with the Golden Maverick leather. I was so disappointed with how my Rowena looked after year, I didn’t even look at the Foxy fix version. And below, is a picture of the Weeks – it fits perfectly in the Chic Sparrow cover. I particularly like this yearly calendar – the numbers are courtrooms I have to be in on a particular day. For me, it not only tells me what room I have to be in, but I know which of my cases is assigned to which room, and which Judge sits in that room, and what it’s there for. So, it may look like code, but I get it. This is a monthly calendar that I decided to decorate. I’m not sure how I feel about the decoration. While it’s certainly minimal but fun, when I pulled it out in court, while standing at counsel table, I found myself hiding the page a bit, not wanting to get asked a question like, are those stickers? Stickers just don’t seem lawyerly. So, this is the undecorated page. A bit sad maybe? A few stickers probably wouldn’t hurt, and really, who should be looking over my shoulder at my book anyway? And this is a weekly page. 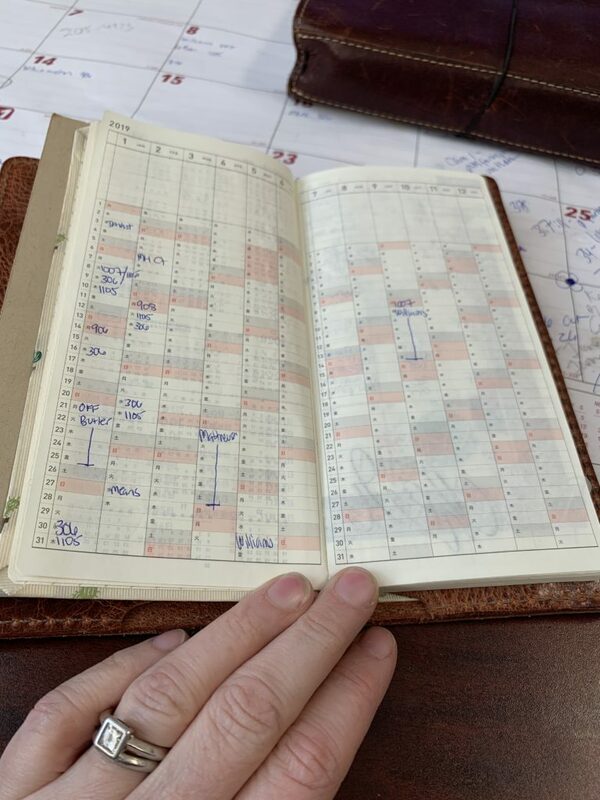 I’ve seen some extremely decorated versions of this on Instagram, so much so that I hardly even recognized it as being a Hobonichi page, with columns and boxes created with washi, stuff like that. I use the notes side for little tidbits about the week – to do’s sometimes, or information I want to save, like the birthday facts. I’ve slept for 16 years! Crazy, doesn’t feel that way. And lastly, here’s the cahier wide sized Foxy Fix Rowena. 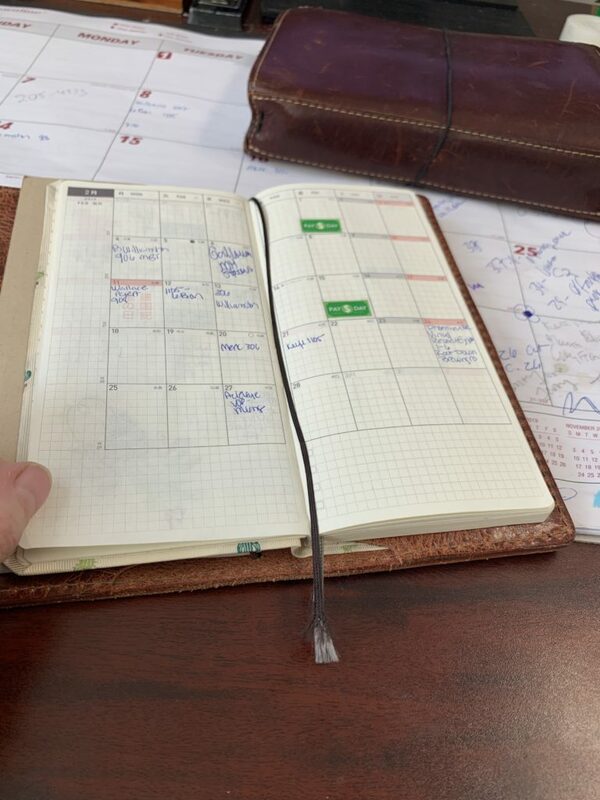 You can kind of see how the notebooks aren’t aligned, when they are the same size. This thing is really heavy, and I don’t carry it around. 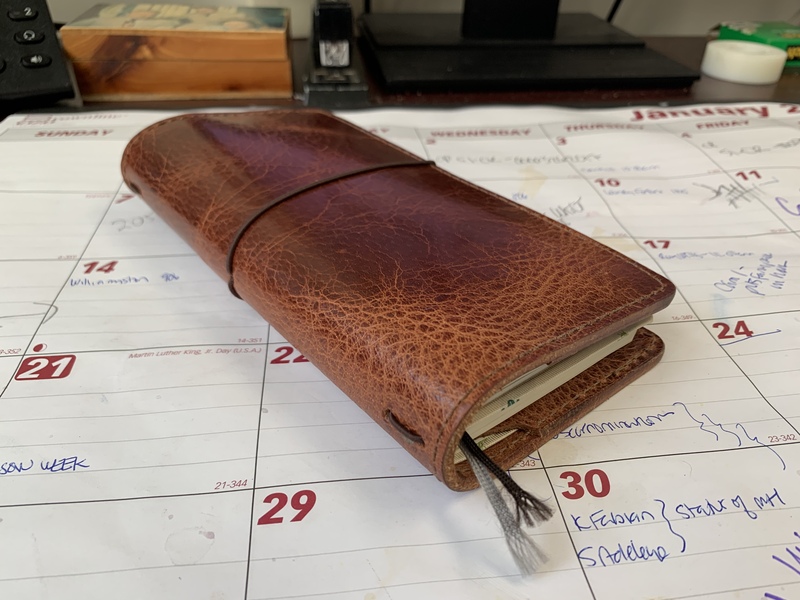 It sits in my bottom desk drawer, and I take the daily writing journal out to both write in, and take home with me on the weekends. The one on top with the rose gold bee is my journal journal, like my diary or my morning pages, or whatever you want to call my free-writing, and the bottom is Book Riot’s Read Harder book journal. This is the inside of the journal. Did you know you can read your Kindle highlights on Amazon, and if you link your Amazon accounts to GoodReads, you can see your highlights there as well. My reading has definitely become more focused, and more present now that I’m highlighting things, and going back and taking a look at them. I’m determined to read more this year. I used to devour books. I wanted to be librarian for a short period of time. But, the last few years, I’ve wasted time on the Internet, or binge watching television, and I’ve slacked off on reading, maybe a book every two months or so. To nudge me along, I’m doing 2 reading challenges – I’m overlapping them so if a book fits more than one category, good for me, clever girl. The first is the Read Harder challenge, since I have the book obviously. 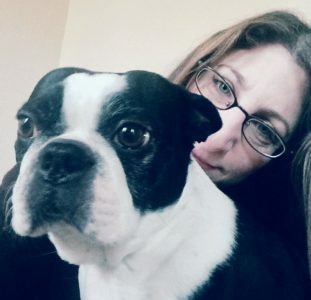 The challenges in the book, however, are different than the 2019 Read Harder Challenge. I’m not trying very hard to do the ones that are actually in the book, but if a book fits, I stick it in. The second challenge is the Pop Sugar Challenge. I thought the Pop Sugar challenge was easier, but the prompts are actually pretty random, and for a lot of the challenges, you can’t really pick a book to fit the challenge, but only know it might work for something when it’s finished. Like, I don’t know if a book is going to make me nostalgic until I finish it. I could say, read a book about a young lawyer, and it will be so far from the truth of the experience, it won’t make me nostalgic, it’ll just make me laugh. And, what’s on the cover? Not so sure when reading on a Kindle. 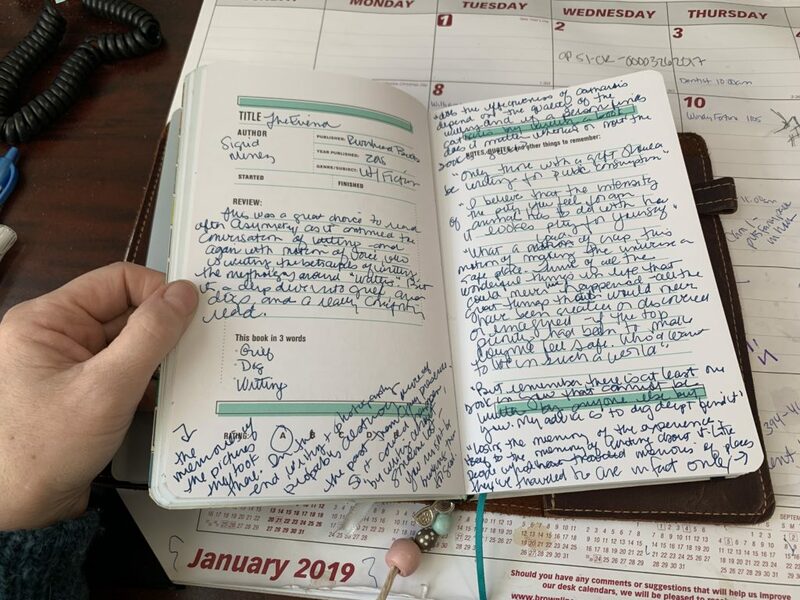 But, in any event, once I finish a book, I record it in my book journal, right a little something about it, and pick out my favorite quotes to remember. And what am I doing all of this recording, journaling, planning, brain vomiting with? 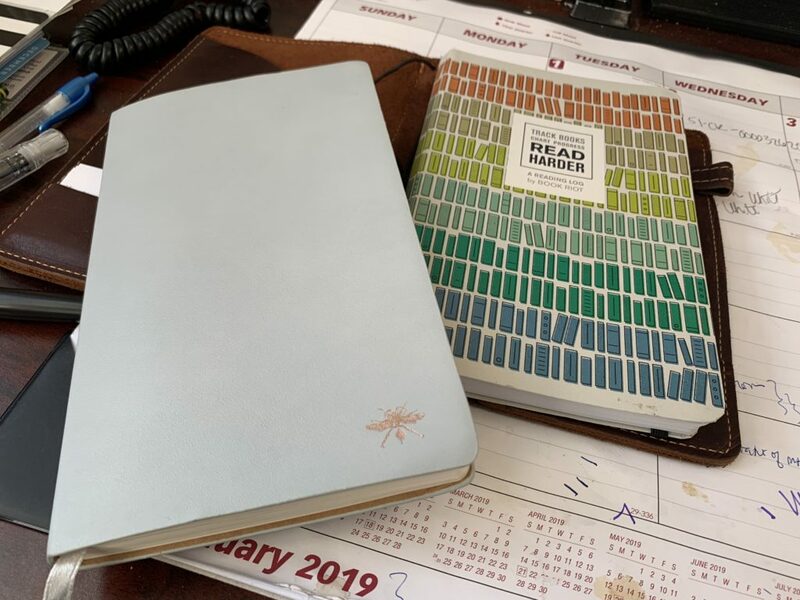 The Read Harder journal is a gel pen that I’ve already lost, so I’m not sure what the next entry will be, but, I’m halfway through Isabel Allende’s Midst of Winter, so I’m sure I’ll figure it out. 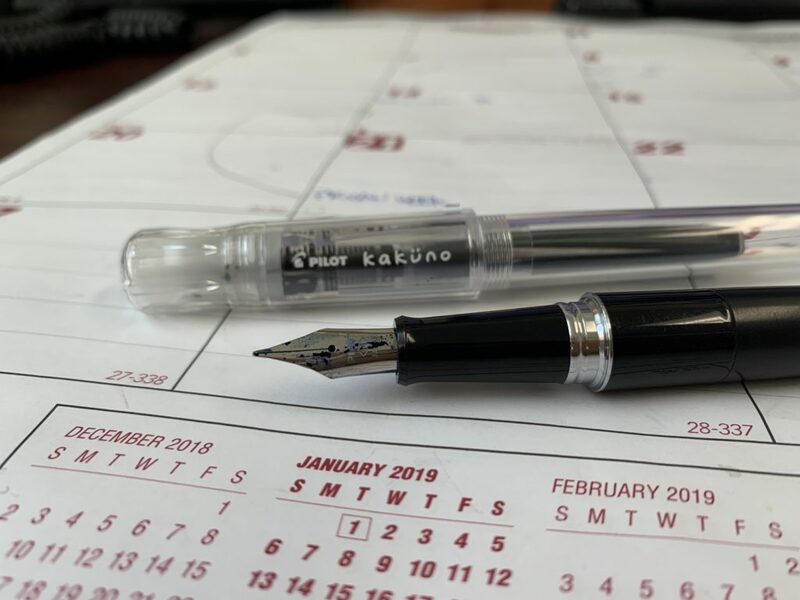 I use a Pilot Easy Touch in the Weeks because that’s what we have at work, and my pens are constantly disappearing, and for my journal/diary I use my two fountain pens, the Pilot Kakuno and the Pilot Metropolitan, which never leave my desk area. These Pilot pens are basically the same pen in different bodies. The Kakuno, though, has a fine nib, and the Metropolitan, I think has a medium. The Kakuno is so fine I could totally scratch a hole in the paper if I’m not holding it correctly. Anyway, I love writing with a fountain pen, and I’ve been wanted to get a next level pen. These pens are $10 and about $16-20 respectively, and they are totally respectable, fine working fountain pens. These pens are cartridge pens though, and while they can be converted to use bottled ink, I think I’d rather spend the money on a a new pen. So, I think I’m might just be getting a new pen for Valentine’s Day with some pretty ink. We shall see. And, fingers crossed, I think I will see a Conklin Durograph and Noodlers’ Black Swan in Australian Roses. PS: You may wonder why the fountain pen doesn’t go to court with me, since that would be the lawerly thing to do, unlike stickers. And, that’s because when I’m sitting with an incarcerated client at the bar of the court, they often take my pens to write me notes – that’s a lie! ask him this . . . and a fountain pen is problematic for many reasons in that circumstance. Even when I bring a pen specifically to give to my client, along with a pad of paper, inevitably, my pen ends up in their hands. A ballpoint, whatever, but something that pointy? It’s just not a good idea, and I’m sure the sheriffs wouldn’t like it either.